A number cruncher at scouter.com ran the numbers. BSA Inc’s 2018 membership dropped 6% from 2017. They predicted a 2% gain. SIX PERCENT. THAT IS DRAMATIC. CEO SHOUILD BE TERMINATED, HIS PAY CLAWED BACK. The board of directors should be charged with malfeasance. 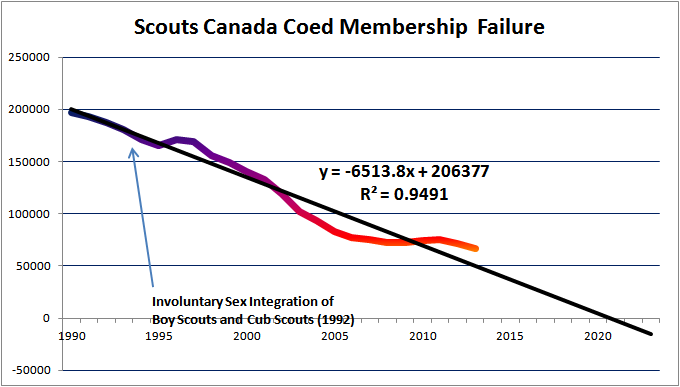 Unsexed boy scouting is a failure. It’s not like anyone could see it coming. Who knew? If you’ve heard it once you’ve heard it a hundred times. Like most things SJW it is a lie. And yes it’s usually doubled-down. Not surprisingly it had the exact same analysis, diagnosis and prescription for the Royal Boy Scouts: ditch the tradition, scrap the uniform, drop “Boy” from the name and open up to girls and younger children. The result was an immediate and irrecoverable plummet in membership. The growing crisis in the Scout movement. A Crisis in the Scout movement? The fact that there are problems within Scouting can be evidenced from two factors. One; a loss in numbers, and two; the growing number of independent organisations, often of a traditionalist nature in reaction to changes designed to modernise scouting in an attempt to hold numbers. It must be noted that the crisis of the scout movement in the west is not reflected universally. Other societies have not experienced social transformation at the same rate, or in the same direction. This means that the traditional image of the scout in these countries will continue to share a backdrop with its society at large. In other countries, the scout movement will be one of a relatively few agencies in the provision of youth work, as was true for Britain in the Edwardian period, and therefore not present a picture of decline. Here is an excerpt of a fascinating academic paper on Boy Scouts of America membership trends from its foundation through to publication. This section concerns the abject failure of SCOUTING/USA, SCOUT:B.S.A. and the Improved Scouting Program of 1971. Written in 2016, Cartographic Depiction and Exploration of the Boy Scouts of America’s Historical Membership Patterns is a master’s thesis by University of Kansas graduate student Matthew Finn Hubbard. The paper is well worth reading. It’s a quantitative analysis of BSA membership trends by geography over time. Hubbard’s main interest is “scout density” as a function of “available boys” or put another way, “What fraction of school-age boys are involved with the Boy Scouts of America” and how that fraction varied over the years. He has a secondary interest in the contrast of rural and urban membership density. The insight is bolstered by factual discussion of related events and trends, such as the Great Depression (economic deprivation) and demographic disruptions (the Baby Boomers). He uses available membership data from counterpart organizations like Future Farmers of America and the Girls Scouts of the United States of America to differentiate membership fluctuations as a function of broad secular trends (i.e., market risk) and narrow BSA policy decisions (i.e., company risk). If you were an enemy of America and perhaps an enemy of Christ, how would you destroy your only real opponent, the Straight White Christian Man? Why, you can’t. He is invincible. Unless you destroy him while still a boy. If I’ve heard it once I’ve heard it a hundred times. If the 35 year trend holds, there won’t be a SCOUTS/CANADA in five years. Be Prepared is the motto that millions of young men, including myself (proud Boy and Sea Scout), around the country learn and live by every year. For 107 years, the Boy Scouts of America have molded young men into leaders who have been at the forefront of business, medicine, politics, religion and a variety of other aspects of our society. When Boy Scouts was first created, it and its sister organizations were the premier youth organizations of the day and for the most part have remained so. As time has progressed, the BSA has had to deal with the challenge of competing for the attention of young men with inventions such as the T.V., the internet, computers, video games and a variety of other items and groups. This has resulted in the BSA struggling with membership for quite a while now. Over the past 40 years, the BSA’s membership has been in a steady decline, with no sign of an end soon. In 2000, the BSA had 3.35 million total youth enrolled in all of its programs. As of 2013 that had fallen to 2.5 million youth and has continued to fall since then. Now, many organizations have had to deal with falling membership in the past but few as prominent as the BSA. The BSA has a program that is absolutely premier and has created some of the finest leaders the nation and the world have ever seen. Some famous former scouts include Neil Armstrong, Michael Bloomberg, President Gerald Ford, Robert Gates, Ross Perot, Donald Rumsfeld, Rex Tillerson, Mike Zinke, Rick Perry and many more.